Toluene diisocyanate is the primary raw material used in the production of polyurethane products. These polyurethane products are employed in numerous applications in various industries. Increase in demand for toluene diisocyanate can be primarily due to rising demand from the bedding and mattress industry. Automotive seats is the other major end-user industry that is anticipated to provide major impetus to the global toluene diisocyanate market. Limitations in supply and volatility in prices of raw materials are anticipated to offer challenging opportunities to market players.Flexible foam was the largest application segment accounting for over 80% of the global toluene diisocyanate market in 2014. Flexible foam is further used in applications such as bedding, mattress, cushions, and automotive seats. Furthermore, the flexible foam segment is expected to continue dominating the global diisocyanate market for the next few years. Other major applications of toluene diisocyanate include rigid foams, adhesives & sealants, coatings, and elastomers. Coatings was the other major application segment in the global diisocyanate market, holding about 6.1% share in 2014. The market share of coatings applications is estimated to decrease slightly by 0.1% in 2023. Toluene diisocyanate-based coatings are extensively used in tank linings, leather, floor and wood finishes, etc. Rigid foam formed the third-largest application segment, constituting about 3.2% of the global toluene diisocyanate market in 2014. Usually, MDI is the preferred material for the production of rigid foams; however, small quantities of toluene diisocyanate are used in the production of rigid foams as well. 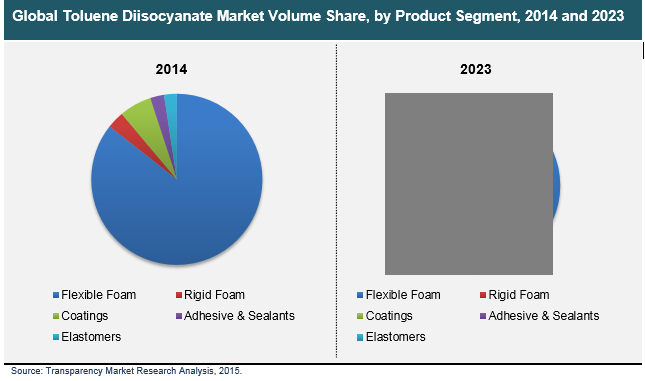 Rigid foams are primarily used in construction, appliances packaging, and transportation systems.Major players in the toluene diisocyanate market include The Dow Chemical Company, Mitsui Chemicals, Inc., and Huntsman Corporation.